I’m introducing a concept that I hope some of my readers may find interesting: the production of an HD video that is entirely built using only the iPhone (and/or iPad). Everything from storyboard to all photography, editing, sound, titles and credits, graphics and special effects, etc. – and final distribution – can now be performed on a “cellphone.” I’ll show you how. Most of the focus of the new crop of highly capable ‘cellphone cameras’ such as is available with the iPhone and certain Android phones has been focused on still photography. While motion photography (video) is certainly well-known, it has not received the same attention and detail – nor the amount of apps – as its single-image sibling. While I am using a single platform with which I am familiar (iOS on the iPhone/iPad), this concept can I believe be performed on the Android class of devices as well. I have not (nor do I intend to) research that possibility – I’ll leave that for others who are more familiar with that platform. The purpose is to show that such a feat CAN be done – and hopefully done reasonably well. It’s only been a few years since the production of HD video was strictly in the realm of serious professionals, with budgets of hundreds of thousands of dollars or more. While there of course are many compromises – and I don’t for a minute pretend that the range of possible shots or quality will anywhere near approach what a high quality DSLR, RED, Arri or other professional video camera can produce, I do know that a full HD (1080P) video can now be totally produced on a low-cost mobile platform. This POC (Proof Of Concept) is intended as more than just a lark or a geeky way to eat some spare time: the real purpose is to bring awareness that the previous bar of high cost cinemaphotography/editing/distribution has been virtually eliminated. This paves the way for creative individuals almost anywhere in the world to express themselves in a way that was heretofore impossible. Outside of America and Western Europe both budgets and skilled operator/engineers are in far lower supply. But there are just as many people who have a good story to tell in South Africa, Nigeria, Uruguay, Aruba, Nepal, Palestine, Montenegro and many other places as there are in France, Canada or the USA. The internet has now connected all of us – information is being democratized in a huge way. Of course there are still the ‘firewalls’ of North Korea, China and a few others – but the human thirst for knowledge, not to mention the unbelievable cleverness and endurance of 13-year-old boys and girls in figuring out ‘holes in the wall’ shows us that these last bastions of stolidity are doomed to fall in short order. With Apple and other manufacturers doing their best to leave nary a potential customer anywhere in the world ‘out in the cold’, the availability, both in real terms and affordability, is almost ubiquitous. With apps now costing typically a few dollars (it’s almost insane – the Avid editor for iOS is $5; the Avid Media Composer software for PC/Mac is $2,500) an entire production / post-production platform can be assembled for under $1,000. This exercise is about what’s possible, not what is the easiest, most capable, etc. Yes, there are many limitations. Yes, some things will take a lot longer. But what you CAN do is just nothing short of amazing. That’s the story I’m going to share with you. A note to my readers: None of the hardware or software used in this exercise was provided by any vendor. I have no commercial relationship with any vendor, manufacturer or distributor. Choices I have made or examples I use in this post are based purely on my own preference. I am not a professional reviewer, and have made no attempt to exhaustively research every possible solution for the hardware or software that I felt was required to produce this video. All of the hardware and software used in this exercise is currently commercially available – any reasonably competent user should be able to reproduce this process. Before I get into detail on hardware or software, I need to remind you that the most important part of any video is the story. Just having a low-cost, relatively high quality platform on which to tell your ‘story’ won’t help if you don’t have something compelling to say – and the people/places/things in front of the lens to say it. We have all seen that vast amounts of money and technical talent means nothing in the face of a lousy script or poor production values – just look over some of the (unfortunately many) Hollywood bombs… I’m the first one to admit that motion picture storytelling is not my strong point. I’m an engineer by training and my personal passion is still photography – telling a story with a single image. So… in order to bring this idea to fruition – I needed help. After some thought, I decided that ‘piggybacking’ on an existing production was the most feasible way to produce this idea: basically adding a few iPhone cameras to a shoot where I could take advantage of existing set, actors, lighting, direction, etc. etc. For me, the this was the only practical way to make this happen in a relatively short time frame. I was lucky enough to know a very talented director, Ambika Leigh, who was receptive and supportive of my idea. After we discussed my general idea of ‘piggybacking’ she kindly identified a potential shoot. After initial discussions with the producers, the green light for the project was given. The details of the process will come in future posts, but what I can say now (the project is an upcoming series that is not released yet – so be patient! It will be worth the wait) is that without the support and willingness of these three incredible women (Ambika Leigh, director; Tiffany Price & Lauren DeLong, producers/actors/writers) this project would not have moved forward with the speed, professionalism and just plain fun that it has. At a very high level, the series brings us into the clever and humorous world of the “Craft Ladies” – a couple of friends that, well, like to craft – and drink wine. I am solely responsible for the iPhone portion of your program – so all errors, technical gaffs, editorial bloops and other stumbles are mine. As said, this is a proof of concept – not the next Spielberg epic… My intention is to follow – as closely as my expertise and the available iOS technology will allow – the editorial decisions, effects, titles, etc. that end up on the ‘real show’. To this end I will be necessarily lagging a bit in my production, as I have to review the assembled and edited footage first. However, I will make every effort to have my iPhone version of this series ready for distribution shortly after the real version launches. Currently this is planned for some time in September. For the iPhone shoot, two iPhone4S devices were used. I need to thank my capable 2nd camerawoman – Tara Lacarna – for her endurance, professionalism and support over two very long days of shooting! In addition to her new career as an iPhonographer (ha!) she is a highly capable engineer, musician and creative spirit. While more detail will be provided later in this post, I would also like to thank Niki Mustain of Schneider Optics for her time (and the efforts of others at this company) in helping me get the best possible performance from the “iPro” supplementary lenses that I used on portions of the shoot. Before getting down to the technical details of equipment and procedure, I’ll lay out the environment in which I shot the video. Of course, this can vary widely, and therefore the exact technique used, as well as some hardware, may have to change and adapt as required. In this case the entire shoot was indoors using two sets. Professional lighting was provided (3200°K) for the principal photography (which used various high-end DSLR cameras with cinema lenses). I had to work around the available camera positions for the two iPhone cameras, so my shots will not be the same as were used in principal photography. Most shots were locked off with both iPhones on tripods; there were some camera moves and a few handheld shots. The first set of episodes was filmed over two days (two very, very long days!!) and resulted in about 116GB of video material from the two iPhones. In addition to Ambika, Tiffany, Lauren and Tara there was a dedicated and professional crew of camera operators, gaffers, grips, etc. (with many functions often performed by just one person – this was after all about quality not quantity – not to mention the lack of a 7-figure Hollywood budget!). A full list of credits will be in a later post. Aside from the technical challenges; the basic job of getting lines and emotion on camera; taking enough camera angles, close-ups, inserts and so on to ensure raw material for editorial continuity; and just plain endurance (San Fernando Valley, middle of summer, had to close all windows and turn off all fans and A/C for each shot due to noise, a pile of people on a small set, hot lights… you get the picture…) – the single most important ingredient was laughter. And there was lots of it!! At one time or another, we had to stop down for several minutes until one or the other of us stopped laughing so hard that we couldn’t hold a camera, say a line or direct the next sequence. That alone should prompt you to check this series out – these women are just plain hilarious. As mentioned previously, two iPhone4S cameras were used. Each one was the 32GB model. Since shooting video generates large files, most user data was temporarily deleted off each phone (easy to restore later with a sync using iTunes). Approximately 20GB free space was made available on each phone. If one was going to use an iPhone for a significant amount of video photography the 64GB version would probably be useful. The down side is that (unless you are shooting very short events) you will still have to download several times a day to an external storage device or computer – and the more you have to download the longer that takes! As in any process, good advance planning is critical. In my case with this shoot, I needed to coordinate ‘dumping times’ with the rest of the shoot: there was a tight schedule and the production would not wait for me to finish dumping data off the phones. The DSLR cameras use removable memory cards, so it only takes a few minutes to swap cards, then those cameras are ready to roll again. I’ll discuss the logistics of dumping files from the phones in more detail in the software section below. If one was going to attempt long takes with insufficient break time to fully dump the phone before needing to shoot again, the best solution would be to have two iPhones for each camera position, so that one phone could be transferring data while the other one was filming. In order to provide more visual control, as well as interest, a set of external adapter lenses (the “iPro” system by Schneider Optics) was used on various shots. A total of three different lenses are available: telephoto, wide-angle and a fisheye. A detailed post on these lenses – and adaptor lenses in general – is here. For now, you can visit their site for further detail. 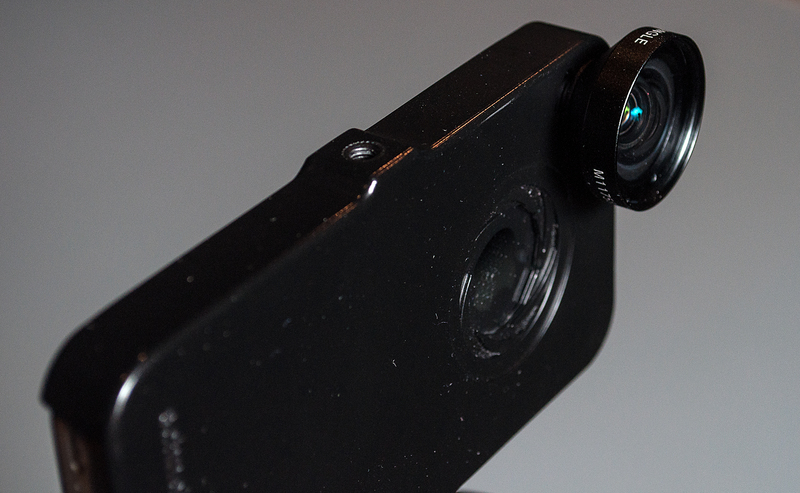 These lenses attach to a custom shell that is affixed to the iPhone. The lenses are easily interchanged with a bayonet mounting system. 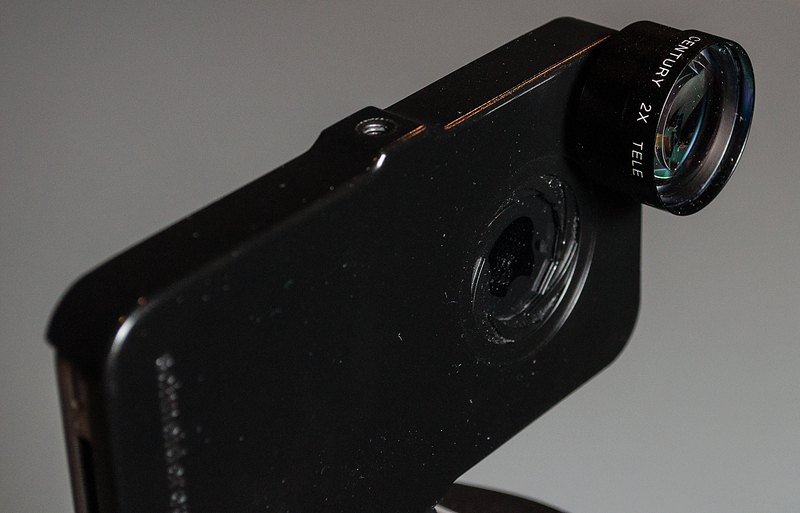 Another vital feature of the iPro shell for the phone is the provision for tripod mounting – a must for serious cinemaphotography – especially with the telephoto lens which magnifies camera movement. Each phone was fitted with one of the iPro shells to facilitate tripod mounting. This also made each phone available for attaching one of the lenses as required for the shot. Another hardware requirement is power: shooting video kills batteries just about faster than any other activity on the iPhone. You are using most of the highest power consuming parts of the phone – all at the same time: the camera sensor, the display, the processor, and high bandwidth memory writing. A fully charged iPhone won’t even last two hours shooting video, so one must run the phone on external power, or plan the shoot for frequent (and lengthy!) recharge sessions. Bring plenty of extra cables, spare chargers, extension cords, etc. – it’s very cheap insurance to keep the phones running. Damage to cables while on a shoot is almost a guaranteed experience – don’t let that ruin your session. A particular challenge that I had was a lack of a ‘feed through’ docking connector on the Line6 “Mobile In” audio adapter (more on this below). This meant that while I was using this high quality audio input adapter I was forced to run on battery, since I could not plug in the Mobile In device and the power cable at the same time to the docking connector on the bottom of the phone. I’m not aware of a “Y” adapter for iPhone docking connectors, but that would have really helped. It took a lot of juggling to keep that phone charged enough to keep shooting. On several shots, I had to forgo the high quality audio as I had insufficient power remaining and had to plug in to the charger. Tripods are a must for any real video work: camera judder and shake is very distracting to the viewer, and is impossible to remove (with any current iPhone app). Even with serious desktop horsepower (there is rather good toolset in Adobe AfterEffects for helping to remove camera shake) it takes a lot of time, skill and computing power. Far better to avoid in the first place whenever possible. 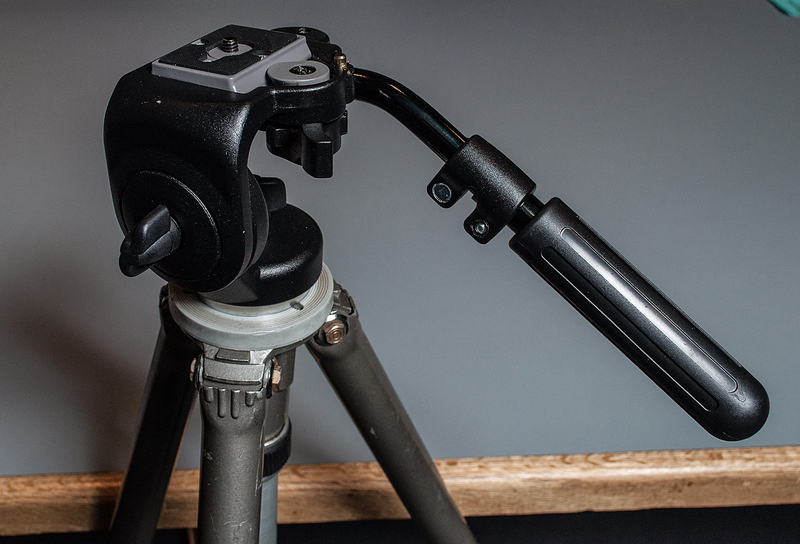 Since ‘locked off’ shots are not as interesting, it’s worth getting fluid heads for your tripods so you can pan and tilt smoothly. 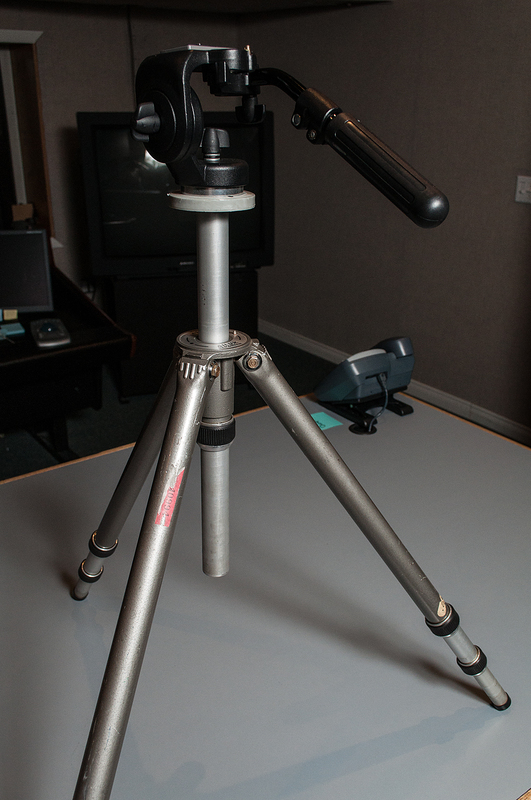 A good high quality tripod is also well worth the investment: flimsy ones will bend and shake. While the iPhone is very light – and this may tempt one to go with a very lightweight tripod – this will work against you if you want to make any camera tilts or pans. The very light weight of the phone actually causes problems in this case: it’s hard to smoothly move a camera that has almost no mass. At least having a very rigid and sturdy tripod will help in this regard. One will need considerable practice to get used to the feel of your particular fluid head, get the tension settings just right, etc. – in order to effect the smoothest camera movements. Remember this is a very small sensor, and the best results will be obtained with slow and even camera pans/tilts. 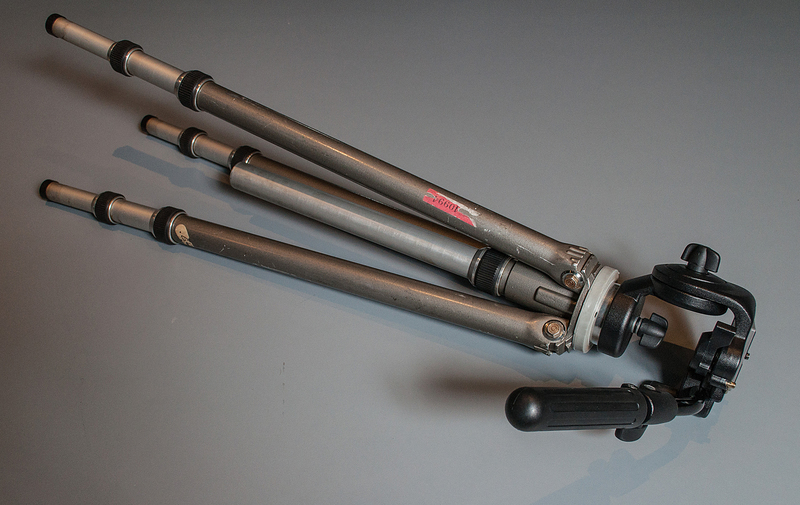 For certain situations, miniature tripods or dollies can be very useful, but they don’t take the place of a normal tripod. I used a tiny tripod for one shot, and experimented with the Pico Dolly (sort of a miniature skateboard that holds a small camera) although did not actually use for a finished shot. This is where the small size and light weight of the iPhone can be a plus: you can hang it and place it in locations that would be difficult to impossible with a normal camera. Like anything else though, don’t get too creative and gimmicky: the job of the camera is to record the story, not call attention to itself or technology. If a trick or a gadget can help you visually tell the story – then it’s useful. Otherwise stick with the basics. Another useful trick I discovered that helped stabilize my hand-held shots: my tripod (as many do) has a removable center post on which the fluid head is mounted (that in turn holds the camera). By removing the entire camera/fluid-head/center-post assembly I was able to hold the camera with far greater accuracy and stability. The added weight of the central post and fluid head, while not much – maybe 500 grams – certainly added stability to those shots. 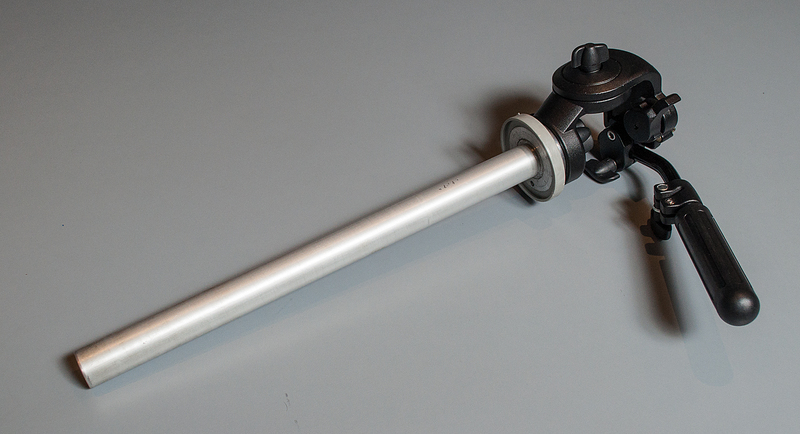 Tripod showing center shaft extended before removal. If you are planning on any camera moves while on the tripod (pans or tilts), it is imperative that the tripod be leveled first – and rechecked every time you move it or dismount the phone. Nothing worse than watching a camera pan move uphill as you traverse from left to right… A small circular spirit level is the perfect accessory. While I have seen very small circular levels actually attached to tripod heads, I find them too small for real accuracy. I prefer a small removable device that I can place on top of the phone itself (which then accounts for all the hardware up to and including the shell) that can affect alignment. The one I use is 25mm (1″) in diameter. I touched on the external audio input adapter earlier while discussing power for the iPhones, I’ll detail that now. For any serious video photography you must use external microphones: the one in the phone itself – although amazingly sensitive, has many drawbacks. It is single channel – where the iPhone hardware (and several of the better video camera apps) are capable of recording stereo; you can’t focus the sensitivity of the microphone, and most importantly, the mike is on the front of the phone at the bottom – pointing away from where your lens is aimed! While it is possible to plug a microphone into the combination headphone/microphone connector on the top of the phone, there are a number of drawbacks. The first is it’s still a mono input – only 1 channel of sound. The next is the audio quality is not that great. This input was designed for telephone conversation headpiece use, so extended frequency response, low noise and reduced harmonic distortion were not part of the design parameters. Far better audio quality is available on the digital docking connector on the bottom of the phone. That said, there are very few devices actually on the market today (that I have been able to locate) that will function in the environment of video cinemaphotography, particularly if one is using the iPro shell and tripod mounting the iPhone. 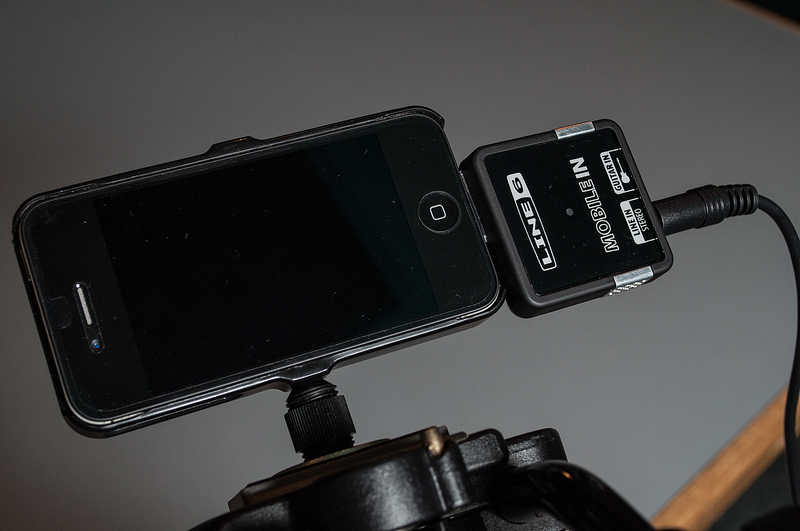 Many of the devices treat the iPhone as just an audio device (the phone actually snaps into several of the units, making it impossible to use as a camera); with others the mechanical design is not compatible with either the iPro case or tripod mounting. Others offer only a single channel input (these are mostly designed for guitar input so budding Hendrix types can strum into GarageBand). The only unit I was able to find that met all of my requirements (stereo line input, high audio quality, mechanically did not interfere with tripod or the iPro case) was a unit “Mobile In” manufactured by Line6. Even this device is primarily a guitar input unit, but it does have a line in stereo connector that works very well. In order to use the hardware, you must download and install their free app (and it’s on the fat side, about 55MB) which contains a huge amount of guitar effects. Totally useless for the line input – but it won’t work without it. So just install it and forget about it. You never need to open the MobilePOD app in order to use the line input connector. As discussed above in the section on power, the only major drawback is that once this device is plugged in you can’t run your phone off external power. Really need to find that “Y” adapter for the docking connector..
“Mobile In” audio input adapter attached. Now you may ask, why do I need a line input connector when I’m using microphones?? My attempt here is to produce the highest quality content possible, while still using the iPhone as the camera/recorder. For the reasons already discussed above, the use of external microphones is required. Typically a number of mikes will be placed, fed into a mixer, and then a line level feed (usually stereo) will be fed to the sound recorder. In all ‘normal’ (aka not using cellphones as cameras!!) 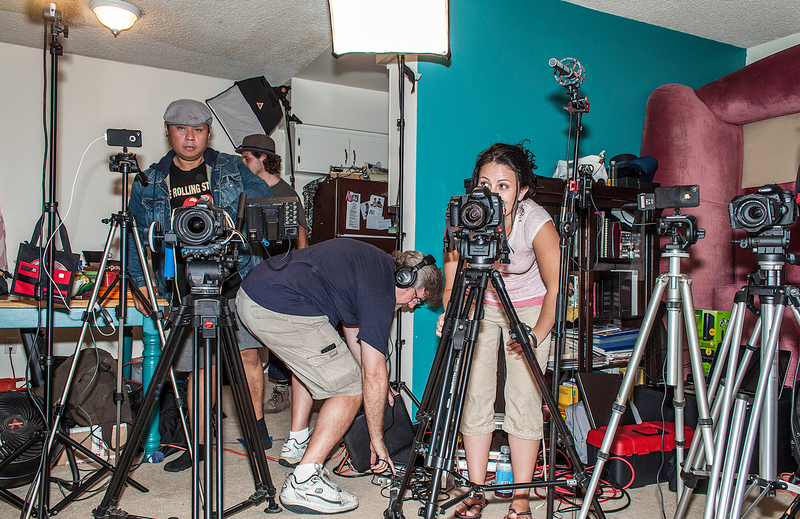 video shoots, the sound is almost always recorded on a separate device, just synchronized in some fashion to each of the cameras so the entire shoot is in sync. In this particular shoot, the two actors on the set were individually miked with lavalier microphones (there is a whole hysterical story on that subject, but it will have to wait until after that episode airs…) and a third direction boom mike was used for ambient sound. The three mikes were fed into a small portable mixer/sound recorder. The stereo output (usually used for headphone monitoring – a line level output) was fed (through a “Y” cable) to both the monitoring headphones and the input to the Mobile In device. Essentially, I just ‘piggybacked’ on top of the existing audio feed for the shoot. Record the most dynamic range possible without distortion (big range between soft and loud sounds). This will markedly improve the presence of your audio tracks. Keep all background noise to an absolute minimum. Turn off all cellphones! (put the iPhone that are ‘cameras’ in “airplane mode” so they won’t be disturbed by phone calls, texts or e-mails). Turn off fans, air conditioners, refrigerators (if you are near a kitchen), etc. etc. Take a few moments after calling ‘quiet on the set’ to sit still and really listen to your headphones to ensure you don’t hear any noise. If you use lavalier mikes (those tiny microphones that clip onto clothing – they are available in ‘wired’ or ‘wireless’ versions) you need to listen carefully during rehearsals and actual takes for clothing rustle. That can be very distracting – you may have to stop and reposition the mike so that the housing is not touching any clothing. These mikes come with little clips that actually mount on to the cable just below the actual microphone body – thereby insulating clothing movement (rustle) from being transmitted to the sensor through the body of the microphone. Take care in mounting and test with your actor as they move – and remind them that clasping their hands to their chest in excitement (and thumping the mike) will make your sound person deaf – and ruin the audio for that shot! Storage and the process of dumping (transferring video files from the iPhones to external storage) is a vital part of both hardware, software and procedure. The hardware I used will be discussed here, the software and procedure is mentioned in the next section. Since the HD video files consume about 2.5GB for every 10 minutes of filming, even the largest capacity iPhone (64GB) will run out of space in short order. As mentioned earlier, I used the 32GB models on this shoot, with about 20GB free space on each phone. That meant that, at a maximum, I had a little over an hour’s storage on each phone. During the two days of shooting, we shot just under 5 hours of actual footage – which amounted to a total of 116GB from the two iPhones in total. (Not every shot was shadowed by the iPhones: some of the close-ups and inserts could not be performed by the iPhones as they would have been in the shot composed by the DSLR cameras). The challenge to this project was to not involve anything other than the iPhone/iPad for all factors of the production. The dumping of footage from the iPhones to external storage is one area where Apple (nor any 3rd party developer that I have found) does not offer a purely iOS solution. With the lack of removable storage, there are only two ways to move files off the iPhone: Wi-Fi or the USB cable attached to the docking connector. Wi-Fi is not a practical solution in this environment: the main reason is it’s too slow. You can find as many ‘facts’ on iPhone Wi-Fi speed as there are types of orchids in the Amazon, but my research (verified by personal tests) show that, in a real-world and practical manner 8Mb/s is a top-end average for upload (which is what you need to transmit files FROM the phone to an external storage device). That’s only 800KB/s – so it would take 7 hours to upload one 2.5GB movie file – which is 10 minutes of shooting! Not to mention the issues of Wi-Fi interference, dropped connections, etc. etc. That brings us to cabled connections. Currently, the only way to move data off of (or on to for that matter) an iPhone is to use a computer. While the Apple Time Machine could in theory function as a direct-to-phone data storage device, it only connects via Wi-Fi. However, the method I chose only uses the computer as a ‘connection link’ to an external hard drive, so in my view it does not break my premise of an “all iOS” project. When I get to the editing stage, I just reverse the process and pull files back from the external drive through the computer back to the phone (in this case using iTunes). I will discuss the precise technique and software used below, but suffice to say here that I used a PC as the computer – mainly just because that is the laptop that I have. It also does prove however that there is no issue of “Mac vs PC” as far as the computer goes. I feel this is an important point, as in many countries outside USA and Western Europe the price premium on Apple computers is such that they are very scarce. For this project, I wanted to make sure the required elements were as widely available as possible. The choice of external storage is important for speed and reliability’s sake. Since the USB connection from the phone to the computer is limited to v2.0 (480Mb/s theoretical) one may assume that just any USB2.0 external drive would be sufficient. That’s not actually the case, as we shall see… While the link speed of USB2.0 supposedly can provide a maximum of 48MB/s (480Mb/s), that is never matched in reality. USB chipsets in the internal hub in the computer, processing power in the phone and the computer, other processes running on the computer during transfer, bus and cpu speed in the computer, actual disk controller and disk speed of the external storage – all these factors serve to significantly affect transfer speed. Probably the most important is the actual speed of the external disk. Most common portable USB2.0 disks (the small 2.5″ format) run at 5400RPM, and have disk controller chipsets that are commensurate, with actual performance in the 5-10MB/s range. This is too slow for our purposes. The best solution is to use an external RAID array of two ‘striped’ disks [RAID 0] using high performance 7200RPM SATA disks with an appropriately designed disk controller. Devices such as the G-RAID Mini system is a good example. If you are using a PC, get the best performance with an eSATA connection to the drive (my laptop has a built-in eSATA connector, but PC Card adapters are available that easily support this connectivity for computers that don’t have it built in). This offers the highest performance (real-world tests show average write speeds of 115MB/s using this device). If you are using an Apple computer, opt for the FW800 connection (I’m not aware of eSATA on any Mac computer). While this limits the performance to around 70MB/s maximum, it’s still much faster than the USB2.0 interface from the phone so it’s not an issue. I have proven that having a significant amount of ‘headroom’, in terms of speed performance, on the external drive, is desirable. You just don’t need the drive to slow things down any. There are other viable alternatives for external drives, particularly if one needed a drive that did not require an external power supply (which the G-RAID does due to the performance). Keep in mind that while it’s possible to run a laptop and external drive all off battery power, you really won’t want to do this – for one, unless you are on a remote outdoor location shoot, you will have AC power – and disk writing at continuous high throughput is a battery killer! That said, a good alternative (for PC) is one of the Seagate GoFlex USB3.0 drives. I use a 1.5TB model that houses a high-performance 7200RPM drive and supports up to 50MB/s write speeds. For the Mac, Seagate has a Thunderbolt model. Although the Thunderbolt interface is twice as fast (10Gb/s vs 5Gb/s) as USB3.0 it makes no difference in transfer speed (these single drive storage devices can’t approach the transfer speeds of either interface). However, there is a very good reason to go with USB3.0/eSATA/Thunderbolt instead of USB2.0 – overall performance. With the newer high-speed interfaces, the full system (hard disk controller, interface chipset, etc.) is designed for high-speed data transfer, and I have proved to myself that it DOES make a difference. It’s very hard to find a USB2.0 system that matches the performance of a USB3.0/etc system – even on a 2.5″ single drive subsystem. The last thing to cover here under storage is backup. Your video footage is irreplaceable. Procedure will be covered below, but under hardware, provide a second external drive on the set. It’s simply imperative that you immediately back up the footage on to a second physical drive as soon as practical – NOT at the end of the day! If you have a powerful enough computer, with the correct connectivity, etc. – you can actually copy the iPhone files to two drives simultaneously (best solution), but otherwise plan on copying the files from one external drive to the backup while the next scenes are being shot (background task). Proper transport cases, bags, etc. to store and carry all these bits. Organization, labeling, color-coding, etc. all helps a lot when on a set with lots of activity and other equipment. Plenty of power strips and extension cords. Small folding stool (appropriate for the table above), or an ‘apple box’ – crouching in front of computer while manipulating high value content files is distracting, not to mention tiring. Cooling. Mentioned earlier, but you’ll need to keep the phone and computer as cool as practical (unless of course you are shooting in Scotland in February in which case the opposite will be true: trying to figure out how to keep things warm and dry in the middle of a wet and freezing moor will become paramount). Special mention for ocean-front shoots: corrosion is a deadly enemy of iPhones and other such equipment. Wipe down ALL equipment (with appropriate cloths and solutions) every night after the shoot. Even the salt air makes deposits on every exposed metal surface – and later on a very hard to remove scale will become apparent. A final note for sunny outdoor shoots: seeing the iPhone screen is almost impossible in bright sunlight, and unlike DSLRs the iPhone does not have an optical viewfinder. Some sort of ‘sunshade’ will be required. While researching this online, I came across this little video that shows one possible solution. Obviously this would have to be modified to accommodate the audio adapter, iPro lenses, etc. shown in my project, but it will hopefully give you some ideas. (Thanks to triplelucky for this video). As amazing as the hardware capabilities of the above system are (iPhone, supplemental lenses, audio adapters, etc.) – none of this would be possible without the sophisticated software that is now available for this platform at such low cost. The list of software that I am currently using to produce this video is purely of my own choosing – there may be other equally viable solutions for each step or process. I feel what is important is the possibility of the process, not the precise piece of kit used to accomplish the task. Obviously, as I am using the iOS platform, all the apps are “Apple iPhone/iPad compliant”. The reader that chooses an alternate platform will need to do a bit of research to find similar functionality. 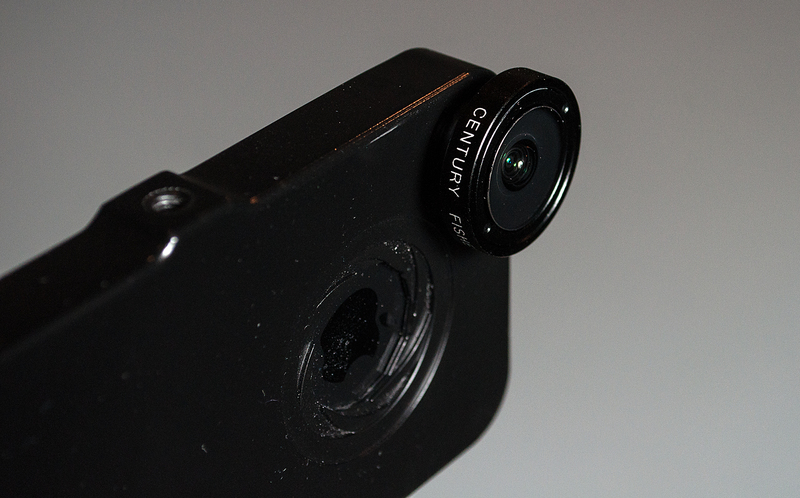 As a parallel project, I am currently describing my experiences with the iPhone camera in general, as well as many of the software packages (apps) that support the iPhone still and video camera. These posts are elsewhere in this same blog location. For that reason, I will not describe in any detail the apps here. If software that is discussed or listed here is not yet in my stable of posts, please be patient – I promise that each app used in this project will be discussed in this blog at some point. I will refer the reader to this post where an initial list of apps that will be discussed is located. Here is a short list of the apps I am currently using. I may add to this list before I complete this project! If so, I will update this and other posts appropriately. Avid Studio The renowned capability of Avid now stuffed into the iPad. Video, audio, transitions, etc. etc. Similar in capability to Splice (above) – I’ll have a lot more to say after these two apps get a serious test drive while editing all the footage I have shot. Camera+ I use this as much for editing stills as shooting, biggest advantage over native iPhone camera app is you can set different part of frame for exposure and focus. TrueDoF This one calculates true depth-of-field for a given lens, sensor size, etc. I use this to plan my range of focus once I know my shooting distance. Some of the above apps are designed for still photography only, but since stills can be laid down in the video timeline, they will likely come into use during transitions, effects, title sequences, etc. I used Filmic Pro as the only video camera app for this project. This was firstly based just on personal preference and the capabilities that it provided (the ability to lock focus, exposure and white balance were critical to maintaining continuity across takes in my opinion). Once I had selected a video camera app with which I was comfortable, I felt it important to use that on both the iPhones – again for continuity of the content. There may be other equally capable apps for this purpose. My focus was on producing as high a quality product as possible within the means and capabilities at my disposal. The particular tools are less important than the totality of the process. The process of dumping footage off the iPhone (transferring video files to external storage) requires some additional discussion. The required hardware has been mentioned above, now let’s dive into process and the required software. The biggest challenge is logistics: finding enough time in between takes to transfer footage. If the iPhones are the only cameras used, then in one way this is easier – you have control over the timeline in that regard. In my case, this was even more challenging, as I was ‘piggybacking’ on an existing shoot so I had to fit in with the timeline and process in place. Since professional video cameras all use removable storage, they only require a few minutes to effectively be ready to shoot again after the on-camera storage is full. But even if iPhones are the only cameras, taking long ‘time-outs’ to dump footage will hinder your production. There are several ways to maximize the transfer speed of files off the iPhone, but the best way is to make use of time management: try to schedule dumping for normal ‘down time’ on the set (breaks, scene changes, wardrobe changes, meal breaks, etc.) In order to do this you need to have your ‘transfer station’ [computer and external drive] ready and powered up so you can take advantage of even a short break to clear files from the phone. I typically transferred only one to three files at a time, so in case we started up sooner than expected I was not stuck in the middle of a long transfer. The other advantage in my situation was that the iPhone charges while connected via USB cable, so I was able to accomplish two things at once: replenish battery capacity due to shooting with the Mobile In audio adapter not allowing shooting while on line power; and dumping the files to external storage. Use the fastest hardware connections and drives that you can. Use time management skills and basic logistics to optimize your ‘windows’ for file transfer. Use supplemental software to maximize your transfer speed from phone to external storage. Transfer in small chunks so you don’t hold up production. The last bit that requires a mention is file backup. Your original footage is impossible to replace, so you need to take exquisite care with it. The first thing to do it back it up to a second external physical drive immediately after the file transfer. Typically I started this task as soon as I was done with dumping files off the iPhone – this task could run unsupervised during the next takes.. However, one thing to consider before doing that (and this may depend on how much time you have during breaks): the relabeling of the video files. The footage is stored on your iPhone as a generically labeled .mov file, usually something like IMG_2334.mov – not a terribly insightful description of your scene/take. I never change the original label, only add to it. There is a reason… it helps to keep all the files in sequential order when starting the scene selection and editorial process later. This can be very helpful when things go a bit skew – as the always do during a shoot. For instance if the slate is missing on a clip (you DO slate every take, correct??) having the original ‘shot order’ can really help place the orphan take into its correct sequence. In my case, this happened several time due to slate placement: since my iPhone cameras were in different locations, sometimes the slate was pointed where it was in frame for the DSLR cameras but was not visible by the iPhones. I developed a short-hand description take from the slate at the head of each shot that I appended to the original file name. This does a few seconds (to launch Quicktime or VLC, shuttle in to the slate, pause and get the slate info), but the sooner you do this, the better. If you have time to rename the shots before the backup, then you don’t have to rename twice – or face the possibility of human error during this task. Here is a sample of one of my files after renaming: IMG_2334_Roll-A1_EP1-1_T-3.mov This is short for Roll A1, Episode 1, Scene 1, Take 3. Play into the file with headphones on to ensure that I have video and audio at head, middle and end of each clip. That only takes a few seconds, but just do it. Using Finder or Explorer, get the file size directly off the still-connected iPhone and compare it to the copied file on your external drive. Look at actual file size, not ‘size on disk’, as your external disk may have different sector sizes than the iPhone). If they are different, re-transfer the file. Using the ‘scrub bar’, quickly traverse the entire file using your player of choice (Quicktime, VLC, etc.) and make sure you have picture from end to end in the clip. Then and only then, double-check exactly what you are about to delete, offer a small prayer to your production spirit of choice, and delete the file(s). This is only the beginning! I will write more as this project moves ahead, but wanted to introduce the concept to my audience. A deep thanks to all of you who have read my past posts on various subjects, and please return for more of this journey. Your comments and appreciation provides the fuel for this blog. Please visit and support the talented women that have enabled me to produce this experiment. This would not have been possible otherwise.